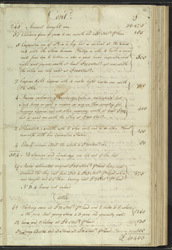 This document is an estimate of the value of Samuel Martin's sugar plantation on the island of Antigua in the year 1768. The Martin family, who were originally from Ireland, emigrated to Antigua in the mid 17th century and became one of the leading families on the island. By the mid 18th century their estate consisted of 605 acres of land, of which 400 were for growing sugar cane. Well equipped works buildings and a large number of slaves were included in the estimate as part of the estate property. The estate was valued because Samuel Martin wished to retire and none of his children wanted to take over its management. The document concludes that the value of the entire estate was £32,000.